My father, Leslie Whitcomb, worked close by the railway arch and took this series of photographs. 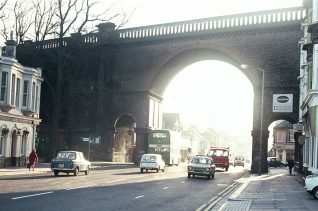 There are two views of the Arches before demolition – from the south and from the north. 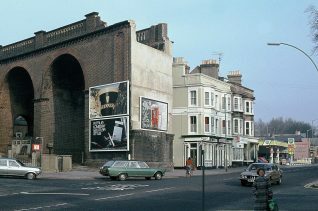 If my memory serves me right, my father worked in the building just visible beyond the right hand mini-arch in the second photo.Of interest are the advertising hoardings showing Guinness and others. 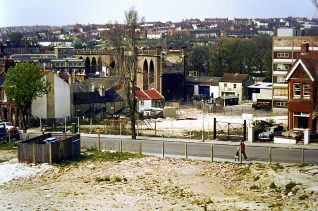 The last photograph shows Cox’s Pill Factory to the left of the viaduct, and in the rear, Hollingdean Estate. Cox’s Pill factory was also later demolished to make way for the present-day Sainsbury’s Store. Do you remember the demolition? Did you live or work nearby? If you can share your memories with us, please leave a comment below. Click on each photograph to open a large image in a new window. I wonder what the point was of the demolition?. Does anybody know? 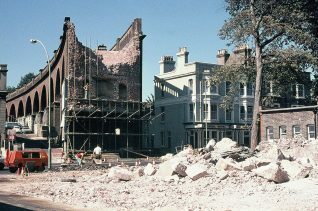 I do remember the demolition very well as I lived at 67 Upper Lewes Road with my parents from January 1971 to May 1976. Our house was at the top of Inverness Road on the west side so we were quite near the arch. I remember that they worked through the night sometimes and used a wrecking ball to demolish the arch. The sound was like a dull thud that went through the house. The area also became very dirty, especially on the roads as the lorries had to remove all the rubble. Our door mat worked overtime that year! I didn’t like the fact that they demolished the viaduct, it was a splendid piece of architecture and it has been replaced by a hideous road system. Great photos, I worked just up the road, 1971/2 and remember it well. I remember the scenes in the pictures very well – I lived in Hartington Rd and used to go to Fairlight School before I started catching the bus to Varndean from the bottom of Hartington Rd (the ‘Melbourne Street’ stop…). I have photos of the demolition myself, showing the section across Melbourne St, with two men stood on top of a ‘stack’ with no safety harness or netting and demolishing the stack by hand tools! I think the reasons for demolition were two fold – the line was disused, with no real prospect then of re-opening and British Railways were responsible for the maintenance of it – costly and with no benefit to them. Also the demolition removed a bottleneck between the end of Upper Lewes Road and the Hollingdean Rd, Bear Rd junction which had long been a traffic problem. The Vogue gyratory came into being quite quickly after the final demolition. Maybe the bricks were recycled at least-there must have been a heck of a lot of them! I used to drink in the pubs around that area at the time. The Alex, Bear, Allen and Gladstone. I remember the demolition very well. It is sad to think of what might have been. When the Kemp Town branch line was constructed it should have gone further. It could have linked Whitehawk. Roedean, Ovingdean, Rottindean, Saltdean, Telscombe, the fledgling Peacehaven and even on to Newhaven. It was also tragic that Cox’s wanted to expand but were refused planning permission. They then moved to Wiltshire. Sainsbury’s then received planning permission and built their store. When you remember that at that time what is now the Centenary industrial estate and the Barracks site were vacant. The whole Vogue gyratory system was a shambles. The island was not supposed to be there but when construction started they were suddenly informed that the Allen Arms was listed and could not be demolished- hence the island. Richard – Cox’s moved to Barnstaple in North Devon (my current home town), but have long since been subsumed into other pharmaceutical manufacturers. 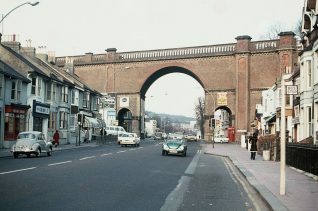 The Lewes road viaduct was before my time but it’s very interesting to see what the area was like back then. Looks like it was an interesting and beautiful piece of Victorian architecture, they don’t build them like that anymore! My understanding is that the branch ceased passenger services in the 1930s and then freight in 1971. It was only ever built in the first place to forestall a rival company building another main line from East Brighton or the Seaford/Newhaven area to London way back in the early days of the railway. A branch line going further to Whitehawk, Rottingdean, Peacehaven or wherever wouldn’t have had enough passengers and made enough money back then to be justifiable. Rob, I do not know much about the cottages. I can remember the sweet shop in front of them. Apparently the fire exit at the Gaiety cinema opened out into the car park at the front of the cottages. That is as much as I know. A Mr Len Cogdale ran a Con/Tob shop at No. 96, the end shop next to the BP petrol station in the picture: “Roadway arch now gone”. I met his daughter in 1963 and by 1966 he was my father-in-law. He closed down in the early 70’s so didn’t witness the demolition. The petrol station then was a showroom for A&H Motors, who also had an open yard directly opposite, where they once displayed rows of Austin 7 Rubys for sale for about £50! The directors (Cohens) moved on, forming the company responsible for building the Brighton Marina. Does anyone know anything about the people living at any point at 66 Upper Lewes Road? I bought the house and would love to know about any previous tenant, or it’s history. Paul Clarkson, I guess they would have been your neighbours? Recha, the best way to find out about the former occupants is to visit The Keep at Falmer where they have a long date range of street directories to provide the info you need. To start you off the earliest Kelly’s I have is 1914 and that shows James Rooke at 66. These are fabulous photos, on a number of levels. 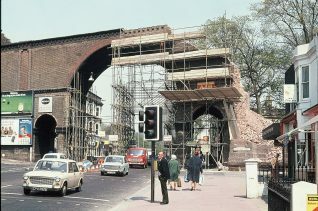 First, it is fascinating to see the ‘inside’ brickwork as the bridge is being demolished. Second, the colour of the photos brings them to life. There is a man, in one of them, that could be ‘everyman’ of a certain age. Some men of that age wear much the same, today, as they did in the 1970s. Thirdly, I found myself wondering if there are bricklayers who could still build with this degree of complexity. I used to like walking under these sorts of bridges and looking at the detail of the curves of them. The bricklayers seem to have built in three dimensions. Recha. Thank you for your interest. My parents bought number 67 in 1971 and I left in 1976 with my parents remaining in the house until my mother sold up in 1988. I don’t know a lot about who was in number 66 at the time I was there as my parents didn’t have a lot to do with them unfortunately. I remember it was a very busy road as it was a route the big juggernauts used to take to get through Brighton but hopefully it is quieter now due to the Brighton by pass. There was a fabulous cobbler who used to do our shoes at the top of Inverness Road. If you want to look at the history of the occupiers the best place is the fabulous website called My House My Street. I remember the cobbler in Upper Lewes Road. As I recall the shop was painted a dark green and the smell of leather and rubber and polish was something else. We used to be regular visitors there too in the 1960s & 70s.